Nepal Education > Nepal Education: Our Textbooks Hinder Learning! 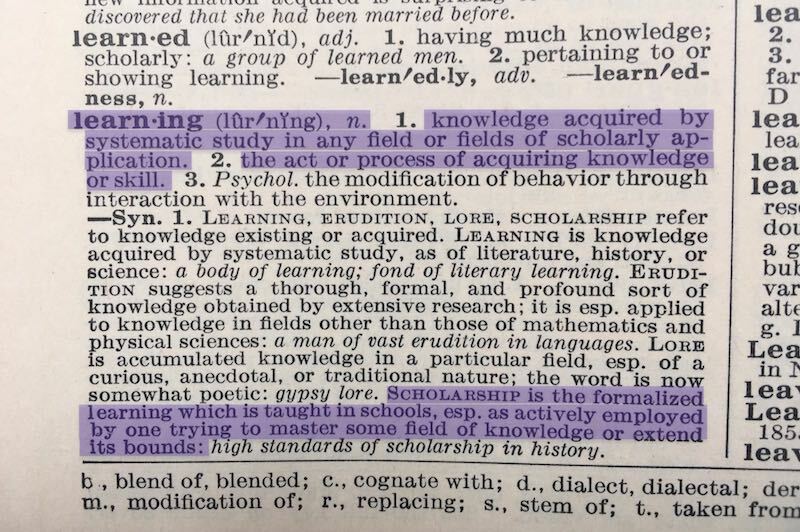 The entry on “learning” in The American College Encyclopedic Dictionary reads thus (the first highlighted bit). The entry also includes a bit on scholarship (the second highlighted bit). 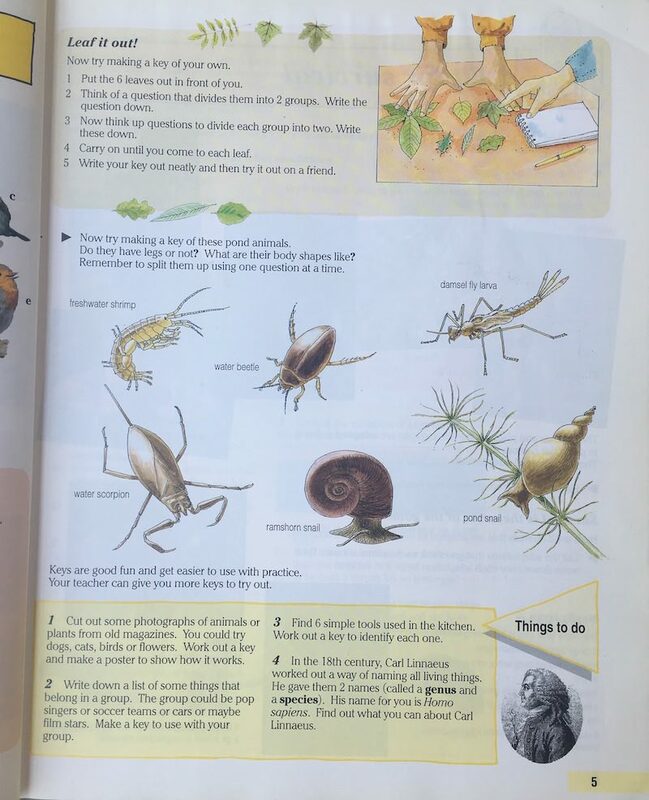 What the fifth-grade science textbook published by the Government of Nepal teaches, and therefore the learning our ten-year old students engages in, is anything but! The following are the first three pages from the My Science, Health and Physical Education, Book 5. The chapter is about animal classification. The whole chapter is just a long description of the characteristics of every group of animals. All of the following and more terms, many latin and difficult, appear in the chapter: Fishes (Pisces), class, Amphibia, Reptilia, Aves, Mammalia, pinnae, phyla, Protozoa, binary fusion, amoeba, paramecium, uglena, Porifera, spongilla, Coelenterata, tentacle, hydra, Platyhelminthes, parasite, tapeworm, Nemathehelminthes, anterion, posterior, ascaris, Annelida, Arthropoda, exoskeleton, thorax, Mollusca, Echinodermata. To the science teacher in me, when it comes to classification, two things are of considerably more importance and use for student to learn than the classification itself (and therefore those terms!). The two things are HOW and WHY scientists classify. Unfortunately, none of that appears anywhere in the chapter. Those aren’t addressed even in the end-of-chapter questions which I’ll come back to later. Spotlight Science 8, an English textboook, on the other hand, starts the book off with a chapter titled “Find the Key” — HOW scientists classify. See below for the reproduction of the chapter. Notice how the book, which incidentally is for older kids, is nowhere near as text-heavy as our own either. Spotlight Science, published in the UK, is a three-book (7, 8, and 9) series covering 36 topics. The books are meant for grades 7-9. This chapter is the first reference to classification AND it delves into the basis for it, instead of describing the classification! In other words, how scientists do it — the tool scientists use! The classification of animals itself does NOT appear in the series at all. And for that reason, I doubt it appears in any English primary school textbook. There’s a simple explanation for that. The how of classification teaches children about how science is done and in the process imparts, to them, a skill. Additionally, teaching them why we classify would have taught them about one of the many purposes behind science. 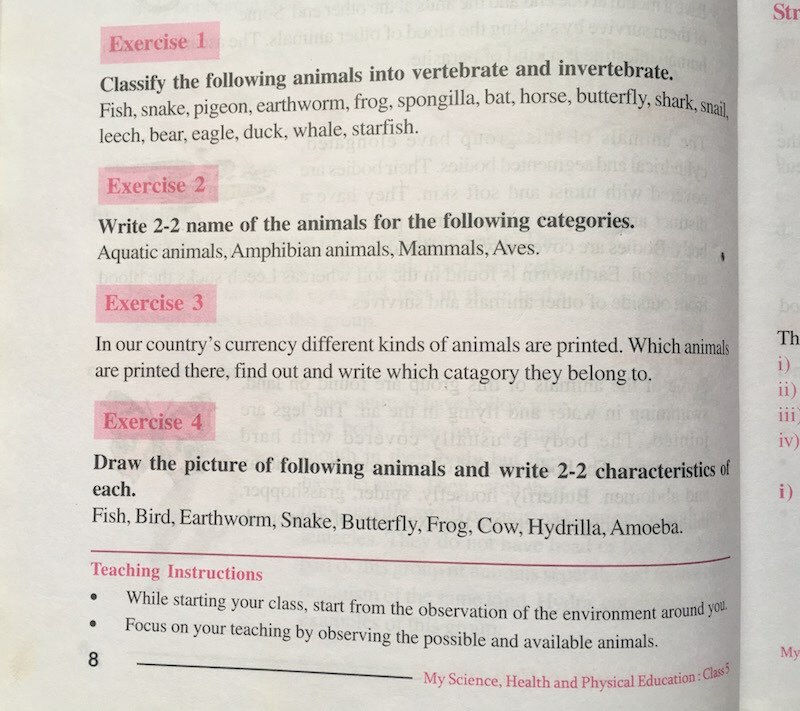 But since the concern of science education in Nepal is NOT any of that, nowhere in the text of the chapter “Different Kinds of Animals” nor in the questions that follow (see image below) does anything remotely addressing either of the two appears. What about the rest of the book? Of course, it’s pretty much more of the same. Here are some additional choice fancy words I found: cytoplasm, vacuole, monocotyledone, dicotyledons, calyx, corolla, androecium, gymnoecium, defecation, urination, urbanization, cirrus, cumulous, stratus, nimbus, umbra, penumbra. 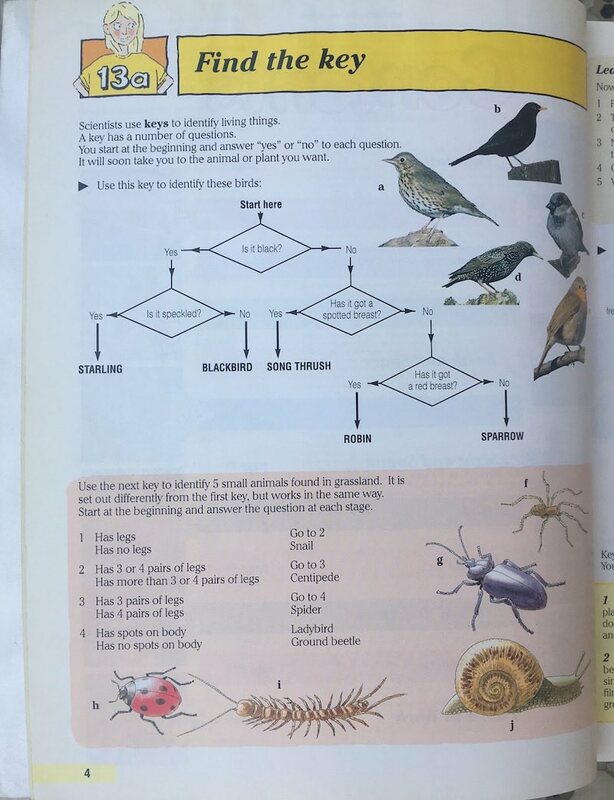 Let me remind you, again, that these are terms appearing in the science textbook for ten-year old students for whom English is a second language! You might argue that the teachers will cover the how’s and why’s in the classroom when going over the materials in the chapter. 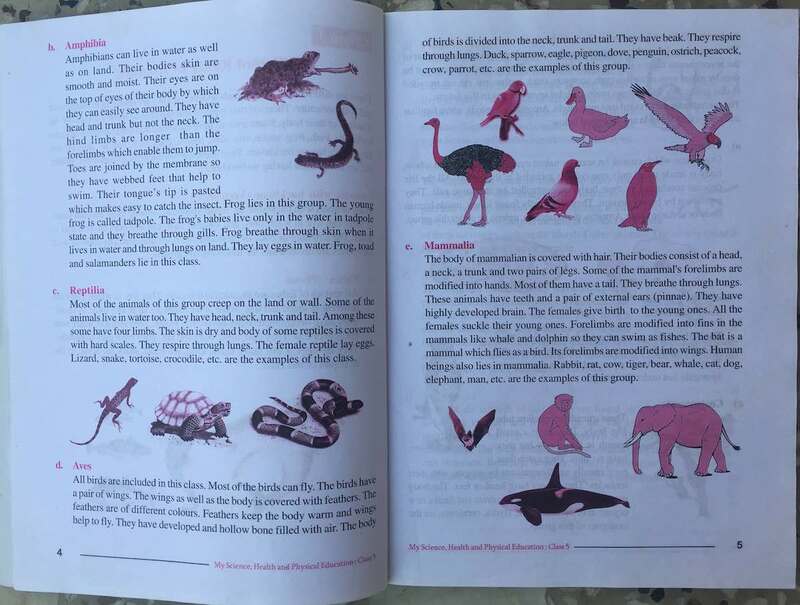 Of course, the contents of this particular chapter could be delivered to the students through a series of activities involving the development of a key and discussions on why scientists have gone to the trouble of classifying animals. That, unfortunately, is NOT how teaching in most public schools in the country occurs. Teachers teach directly from the book instead of delivering lessons which impart the concepts and skills covered in the chapter or are parts of the topic. Forget about expanding on them! Given the utter lack of description for how and why, and an utter lack of relevance of those fancy terms to their daily lives, and given the standard chalk-and-talk teaching methodology employed by most teachers, the only thing our ten-year olds CAN do is memorize the difficult terms. Having established rote-learning and regurgitation school culture in primary school, teachers in both secondary and tertiary education institutions teach the same limited skills. Learning in education institutions in Nepal is far from what it means and what it should be. Scholarship, unfortunately, for most students in the country, is just a path to a qualification, a paper, NOT for the mastery “of some field of knowledge,” forget about “extend[ing] its bound.” Sadly! Incidentally, this grade 5 textbook is not an example of an exceptionally terrible textbook. Pretty much all textbooks I have seen and have read about are of such poor quality. I have blogged about issues with other textbooks. In Grade 8 Social Studies Textbook: The Caste System Is a “small” Issue I talk about precisely that! In Revised and Updated Does NOT Mean Revised and Updated, I detail how textbook publishing and schools issuing textbooks of their choice is basically a scam to fleece the parents, among other things. In My My, Hey Hey, My English Book Has It Yay! 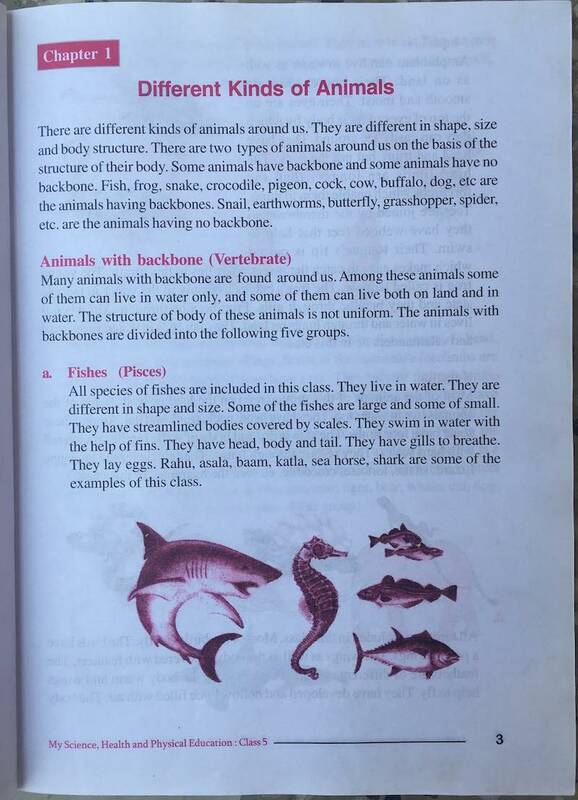 I point out some of the issues with a Grade 3 textbook, while in When A Textbook In Nepal Fail Children I point out issues with a grade 1 computer studies textbook. One of the many other consequences of learning and teaching from such books using archaic chall-and-talk methodology — involving parroting and reading aloud when preparing for a test or examination, for example — by the time children graduate from primary school, the innate sense of curiosity they are born with is beaten out of them, literally in some instances. Why do we have such textbooks in Nepal, still? From what I have gathered, incompetency, carelessness, monopoly, little awareness of or concern for the impact of such products etc. The general mantra towards anything and everything one does, whether you are a high ranking official whose decisions might have life and death consequences for people or average Joe — or Jane — on the streets whose decisions only affect a few around you, is the same: “Let’s make do”! If the choice is between putting out such textbooks or not, I would choose the latter. Besides, the government-run publishing house often struggles to print textbooks on time to begin with anyway. Additionally, in parts of the country, for that and other reasons, textbooks never reach the children. As a matter of fact, we should do away with such textbooks completely as well as with local and national level examinations in grades 8 and 10! In my past career as a science teacher, I taught without following or without the hep of textbooks! And, as I have stated elsewhere in a few different blog posts, I am NOT an outstanding teacher. If I could do it, I don’t see why others shouldn’t be able to do it as well. If we get ride of the textbooks, teachers then can focus on student learning and scholarship! They will struggle and find it a challenge for at most two years, and that’s it! Generations of students have struggled in the past and continue struggle still throughout their academic career and afterwards throughout their entire lives as adults because of poor-quality-textbooks-and-examination-driven education. It’s time to put an end to that. What are the latest concerns of the policy makers though? They have proposed converting all private schools into trusts within ten years — and thereby lowering still the overall poor standard of education in the country — instead of creating and enacting policies which would raise the standard of education at public schools!